Guests for Jay's final week include Mel Gibson, Lyle Lovett, Arnold Schwarzenegger, Wanda Sykes, Sarah McLachlan, Dwight Yoakam and Billy Crystal. 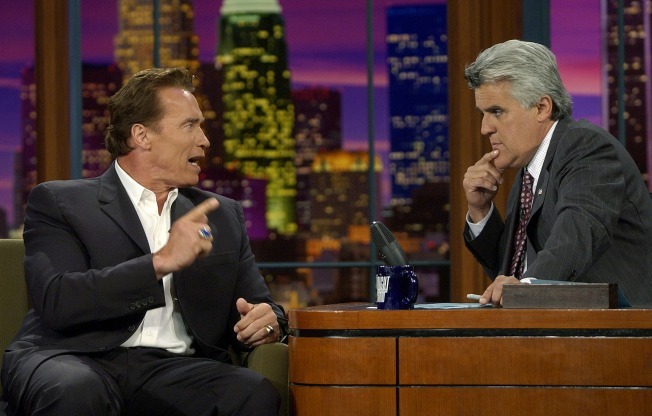 Jay Leno has announced his last "Tonight Show" guests – his successor, Conan O'Brien, and musician James Taylor. Conan and James will appear as the final guests on Jay's final show, which will air Friday, May 29 on NBC, Jay announced on a conference call on Thursday morning. Previously announced guests for Jay's final week include Mel Gibson, Lyle Lovett, Arnold Schwarzenegger, Wanda Sykes, Sarah McLachlan, Dwight Yoakam and Billy Crystal. As for his new primetime show, Jay said he's hoping to bring some humor to an ordinarily dramatic timeslot. "There's no laughs at 10 o'clock," Jay said. "To me, 10 o'clock is like the new 11:30. I hear so many young people, 'I gotta carpool, I gotta get up at 6.'" Of competing with primetime shows such as "CSI" and "Law and Order," Jay said he's expecting to join them in the ratings, though not necessarily the first week. "We're just going to offer an alternative," he said. "This is the long haul. You're on every single day and you just pound away." "It's not rocket science," he added. "It's just that human contact. I enjoy the 10 o'clock dramas. I like 'CSI' and 'SVU' and 'Law and Order,' but there isn't any comedy. When I was a kid, you'd have a whole night of comedy. Now it's all very serious, it's all murder." Reminiscing to his early days on the "Tonight Show," Jay named some guests he'd wished he'd gotten on the show. "When I was a kid, I was a huge fan of Elvis, and I was a huge fan of Jack Benny. He died within a few weeks of me arriving in town, and that was one of my great regrets, that I never got a chance to meet him," Jay said. Though he's moving on now, Jay thought that Conan would leave the show in good hands. "It's a peaceful transition of power," he said. "I really do like the guy."